Maunsell 'Schools' class 4-4-0 locomotive No.30924 'Haileybury' about to enter the 788 yard Hastings tunnel as it departs St. Leonards Warrior Square railway station with a train from London Charing Cross in the summer of 1957. 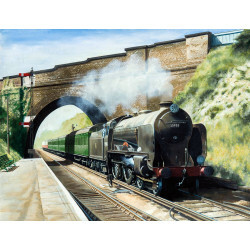 The 'Schools' class were designed for the Hastings to Tonbridge main line - This section of railway having tight clearances within it's restricted-width tunnels. This was the last year of full steam operation on this line as in 1957-58 six coach 6L and 6S Hastings diesel train sets were introduced. 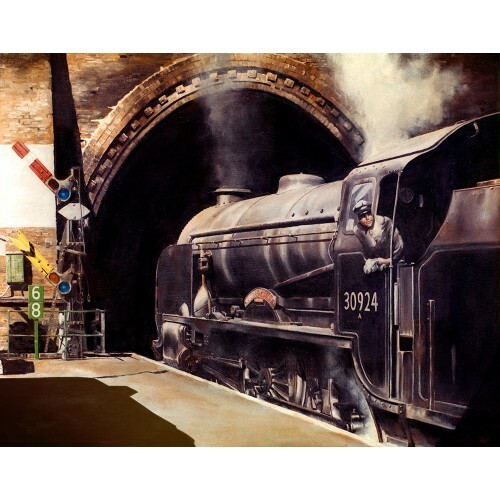 High quality signed giclée print on museum stock paper. 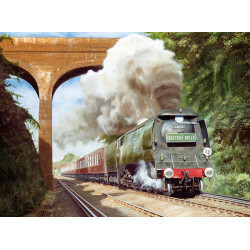 Southern Railway 'Schools' class No.30903 'Charterhouse' passes Chelsfield station with a Charing Cr..